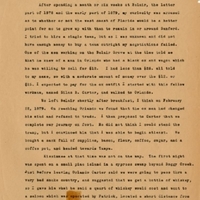 An original manuscript written by Sydney Octavius Chase about his first trip to Tampa, Florida, in 1879. The manuscript chronicles Chase's trip with topics including traveling to Florida's west coast to determine if it were a better location than Belair Grove in Sanford, traveling to Orlando to buy an ox and wagon for the trip and then deciding to continue on foot with Silas B. Carter, preparing to travel through snake country, spending a night with the Yates family near Platt Grove, camping site near the old Collins house in Tampa, Chase's purchase of land in Winter Haven years later, forgetting their powder and shot pouch on the way back to Orlando, and their safe return to Belair. Chase also discussed his second trip to Tampa a year or a year and a half later to conduct business errands for a "Mr. Ingraham," most likely referring to James Edmundson Ingraham, an entrepreneur and railroad company executive. Original manuscript by Sydney Octavius Chase: "My First Trip to Tampa," 1879: box 173, folder 9.52, Chase Collection (MS 14), Special and Area Studies Collections, George A. Smathers Libraries, University of Florida, Gainesville, Florida. Digital reproduction of original manuscript by Sydney Octavius Chase: "My First Trip to Tampa," 1879. Chase Collection (MS 14), box 173, folder 9.52, Special and Area Studies Collections, George A. Smathers Libraries, University of Florida, Gainesville, Florida. Chase, Sydney Octavius. “"My First Trip to Tampa" Manuscript.” RICHES of Central Florida accessed April 19, 2019, https://richesmi.cah.ucf.edu/omeka/items/show/2546.